On Sunday, Erika and I went on a training hike, to start getting into shape for the Fjallraven Classic. This year it’s over 30 miles of backpacking within 3 days, and we’re both a bit nervous about being able to keep up the pace! We went up to White Ranch Park, and ended up hiking about 8 miles (Belcher Hill, Longhorn, Shorthorn, Longhorn, Whippletree, Belcher Hill), with roughly 20lb packs. We went pretty slow, but I think we did OK considering it was our first longer (and loaded) hike of the season. We’ll definitely need to get a few more in between now and the end of June, along with a bunch of basic walking/hiking training as well. The elevation (10,000 ft+) for the Classic is going to be rough, even for us Mile-Highers. According to Fitbit, I did just over 21,000 steps and burned 4,500 calories. My heart rate peaked up around 140bpm briefly. At the Fjällräven Classic, I was a little smitten with the Kajka 75 backpack which I saw a bunch of people carrying around. As it turned out, we got a discount as participants in the Classic, so a few days later I found myself the proud new owner of a Kajka, and in need of a backpacking trip to “break it in”. Since I was still on sabbatical, it was just a matter of picking a location, packing up my gear and heading out. I came across Colorado’s Wild Areas, which has a nice summary of a few backpacking loops. The Eaglesemeare / Surprise Lake Loop one looked perfect for what I wanted, so after a little more reading and planning, I was off on Wednesday morning to hit the trail. I got started a bit late (about 9am), so wasn’t on the trail there until about 11am. Since I was going to end up there, I parked at the Surprise Trailhead, then hiked around to the Eaglesemeare Trailhead and entered the trail there (main backpacking hike is the red line on the map above). It’s a pretty long, steady climb up to the lakes (CalTopo tells me it’s about 1800 feet of elevation, over 4.3 miles distance). Once there, I stopped and cooked up some lunch and had a bit of a break. I fished for a little bit, since I was seeing some small rises, but didn’t catch anything. The lake was so clear that I could actually see some little fish doing the rising, and they were tiny. Once I was fed and rested, it was time to head off again, down from Eaglesmeare and through the valley towards Tipperary Lake, and beyond. Once I got rolling, I decided that I wanted to make it to the trail that leads to Upper Cataract, and hit the small river that runs down near that for my camp. That gave me some water, and a good starting point for the morning. In the morning I got up and broke down camp, then stashed my main pack, and took just the “brain” (top bit) as a day-pack, for a quick hike up to Upper Cataract and Cat Lakes (blue line on the map). I took my rod and gear and had a shot at some fishing up there as well, but again, no luck. It was absolutely gorgeous at Upper Cataract, especially on the small meadow on the west side of the lake. I think I’d like to get back up there and camp right up at the lake at some point. With my morning hike in the bag, I was back down to the main trail, and reunited with my pack. I got everything sorted back out again, and then it was time to hit the mainly-downhill trail back to my truck. Along the way is Surprise Lake (another beautiful alpine lake), which looks like it’s seen a lot of campers over time (big worn out area near it/the trail. I kept on rolling all the way down, and was off the trail and into Silverthorne/Dillon in time for a late lunch, then back home before dinner time. In amongst all of my own trips during my sabbatical, I was flipping through Outside Magazine (a really great periodical, BTW) and saw an ad for something called the “Fjällräven Classic“. As the page linked indicates, it was to be a 20 mile backpacking trip, spaced over 3 days (2 “half” days and a full day, and apparently ended up being more like 22 miles), chaperoned by the lovely folks at Fjällräven. I thought that sounded interesting, and almost flipped the page, when I realized that it was in Colorado, and during my sabbatical. Fate? I don’t believe in that, but it was a pretty neat coincidence which I wasn’t about to let slide. After making sure it’d fit in with some other plans, and debating if I was really up to hiking that far in 3 days (I’d never actively hiked that far in a single trip), I took the plunge and signed up. A few weeks later and I was getting up well before the crack of dawn and heading (conveniently) to my nearest train station which was the Denver shuttle pick up point. There, I loaded up with about 50 other people (there were another 2 buses coming from other locations) and we embarked on the long bus ride up to State Forest State Park (the worst-named State Park, ever). We were greeted with a registration area, mini Fjällräven shop, last minute supplies like stove fuel, and some delicious breakfast and bag-lunches from local chef, Kyle Mendenhall. During registration, we were kitted out very, very well. We got a trucker cap of our choice, a t-shirt, a custom scarf/Buff, a ski-cap/beanie, enough Mountain House food to more than cover the weekend, a small “passport” (included trip details, and was used at check-points to keep track of everyone), a custom trash bag (nice water-proof draw-string bag, to help us LNT) and a Grayl to cover our clean-water needs. So much stuff! This meant some adjustments to our packs to fit everything in, then we were ready to roll. With 120+ hikers participating, the plan was to leave in separate waves. Since I’m an eager-beaver, I jumped in line to leave as part of the first group. We got a few words from Carl from the Fjällräven mothership, an official welcome from Fjällräven US folks, a shotgun salute, and then we were on our way! Pretty quickly, the first group (me included) got off to a bit of a rough start. There was some confusion at the first checkpoint (which was also at the first/only real turn on the trek), and we went off in what turned out to be the wrong direction (going in reverse around the loop we were supposed to hike). With all the excitement of getting people started, it took a while for them to realize where we’d gone, and then to come and get everyone, so we’d actually hiked almost 3 miles by the time they caught up to us in a Polaris/ATV thing. Since I had ended up at the very front, I became the very last (along with Zach and Jack) to get picked up. By that time, we were getting rained on, and had of course sent our packs ahead… with our rain gear. We got hustled back to the first checkpoint to wait out some of the rain, and managed to score a beer or 2 and some snacks while we waited. The plan was to take us to roughly where we should have been if we’d hiked about the same distance, but in the right direction (rather than just dropping us back to the back, and having us try to “catch up”). Since they could only access the trail at certain points, that meant I got dropped off a little before Checkpoint 2, and then continued on from there. At that checkpoint we were served up some Swedish Fish and hot potato/cheese soup, which helped stave off the chill from hiking in alternating rain and hail (mountain weather is crazy). Eventually, after what felt like “up” forever, we reached the lake which marked the end of day one’s hiking. There was some doubt and debate based on the trail markings, but it turned out we were in fact in the right place, so we set up camp (tent city!) in a beautiful alpine meadow, and explored Jewel Lake. It was quite an experience camping in such a remote place, with so many other people nearby, who were all on the same journey. I didn’t know if I was going to like it, but it turned out that it was really cool. We were treated to a pretty awesome sunset, some nifty mist, and then a really chilly, frosty night (someone later suggested it was as low as about 25 degrees). Since we were close to a running water source, we were easily able to use our newly acquired Grayl water bottles with inline filters to get fresh, clean water. I’m really bummed that mine somehow went missing in amongst the shuffle on the bus ride home, so now I don’t have it to use on future hikes. After a chilly night’s sleep, it was up and off for another full day of hiking. This was another day that felt like mostly uphill. A big, long, slow climb up an alpine valley, towards a saddle that had some amazing views of Kelly Lake, which was technically our destination for that day. At a checkpoint along the way, we were greeted with more Swedish Fish, beef jerky and other snacks. At Kelly Lake we were greeted with a happy hour that included some bourbon, more Swedish Fish, snacks and general merriment. Since we reached Kelly early, and since there really wasn’t that much room to camp there, a lot of us continued down the trail to spread out over the next 2 miles or so, into another valley of meadows and creeks and amazing views. By the time the sun was falling, someone had started a fire in an existing fire ring (ssshhhhh), and the evening was spent passing around flasks and gourmet chocolate, listening to a very acoustic set from 2 of the talented guys from Kind Hearted Stranger, who were to be playing at the closing party tomorrow. This night was also frosty, although not as cold as the previous one (about 1,000ft lower elevation definitely helps). In the morning I was up and joining the line of folks heading out towards the end of our journey. This last day was (thankfully!) pretty much all downhill, and we made pretty quick work of it. There was another checkpoint, this time with trail-side pancakes (!! ), lingonberry and elderberry juice and more snacks. From there we were into an area of the park that had been devastated by mountain pine beetle, and so a lot of it had been cleared to try to prevent spread, and reduce fire risk. It was a bit of a bummer to end our otherwise-gorgeous trek with a lot of time spent amongst that, but we did get to pass through an Aspen grove, and at that point there was a lot of good conversation happening anyway, so I can’t really complain. Back at base camp we were awarded a small medal for finishing, received a neat commemorative clothing-patch, and were treated to more music by the full lineup of Kind Hearted Strangers. There was also a much-needed and anticipated, massive spread from chef Mendenhall. Campfire-cooked trout, delicious steak, vegetables, and peach cobbler for dessert. Fantastic. After a few hours of amazing food, amazing music, and reminiscing with a group of amazing people, it was time to load back onto our bus and head back to reality. I had a really great time, and will definitely make a space in my calendar next year for this event again. It is such a unique and fun way of experiencing the outdoors, even if doing it with so many other folks isn’t normally my thing as far as wilderness experiences go. A huge thank you to the folks at Fjällräven for organizing, Human Movement for event coordination, Kyle Mendenhall (and crew), plus Mountain House for the meals, and Grayl for the excellent water bottle. Looking forward to next time. I was now getting used to the pace a bit better, and decided to change up my plans again. I had originally planned to camp at the end of day 6 at Sand Island. Not (at all) because it looked like a cool place to camp, just because I thought I’d be pretty tired, and would only really make it that far. I recalculated, decided to shoot straight through to Moab at the end of the day, and went for it. 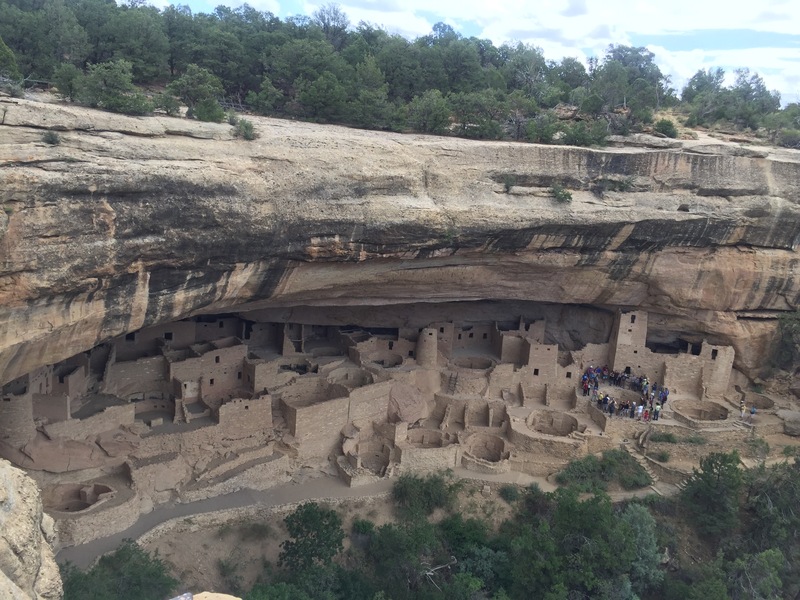 First up today was Mesa Verde National Park. This was actually something I was really looking forward to, as “ancient” cultures really fascinate me, and I’ve always been particularly amazed that people would be able to build entire cities in the faces of these cliffs, and survive out here in a really unforgiving place. I should have planned ahead a bit more and 1. realized how far the drive is from the entrance of the park, to everything you can look at, and 2. arrange a walking tour in amongst one of the cave dwellings. Since I did neither of those things, I felt a bit rushed, and had to settle for mostly just looking at the dwellings from the facing cliffs (luckily I picked up a pair of cheapo binoculars along the way which helped a bit). It was still a highlight though, and I got to see a bunch of dwellings, check out the museum, and learn a bit more about the people of the area. One thing I saw in the museum at Mesa Verde that really stuck with me was the demonstration of how most common pottery shapes can be directly tied to the shapes found in traditional gourds (pictured above). Really interesting, and so logical in hindsight. The monument itself is pretty weird, and feels super random. It’s out in the middle of nowhere (well, I guess technically it’s in the corner of four nowheres! ), with scrubby, “desert” around it in every direction. You drive for a long, long time to get there, and then there’s nothing except this weird plaza, surrounded by small stalls. The stalls are (partially) filled with Native Americans who are selling trinkets and tchotchkes. It’s eerie. Then there’s a line of mostly-silent people, who orderly wait their turn to head to the center of the monument and take their requisite 3 photos each (as dictated by signs posted all around the center). Very strange. Anyway, I got my selfie, touching all 4 states at once, so I guess now I have technically “been to” New Mexico (had not been before). I also bought some “Navajo Frybread” from a stall near the monument (mmm delicious and oily!) and then I was done. From there, I got back on the long, boring, flat, straight roads, and headed into Colorado again, then turned and was off into Utah. I pretty much just drove right through to Moab, without really stopping. I think I pulled over a couple times just to stretch my legs, but didn’t really hang out anywhere. Once I got to Moab, I actually rolled right through, took a right on Highway 128, and started looking for a spot to camp for the night. The BLM maintains a number of campgrounds along this scenic byway, and since they’re first-come, first-served, I was hoping to get a spot not too far from town. I got pretty lucky and found a decent site in the Drinks Canyon campground, perfect for one small tent. I paid my $15, set up for the night, and enjoyed some pretty epic views from right on the banks of the Colorado River.